It has taken me a long time to “get” full size multi-tools. I don’t think I am alone with this. They sound great in theory, but they are so big and bulky that for the average person they are more trouble to EDC than they are worth. Sure they come with belt sheathes, but lets face it, unless you work in the trades or some other physical job you can’t get away with carrying one of these on a belt sheath. I suspect this is why Grayson didn’t care for his Charge TTi, and this is why my Leatherman Wingman spent months on my desk after I bought it. I liked the spring loaded pliers on my Micra and Squirt, so I decided to pick up the Wingman. It was cool but I didn’t find much of an occasion to carry it. But all of that changed when we bought a fixer upper house. Suddenly, instead of spending Saturday morning drinking coffee and writing knife reviews I was out at the new house, demolishing, shoveling, hauling, sanding, scraping, hammering, priming, and painting. A house like this isn’t a project; it’s a hundred small projects, all of them requiring the use of basic hand tools. On a whim I decided to take my Wingman with me, strapped to my hip in a belt sheath. Only then did I finally understand the point of these multi-tools. Several weeks later and the Wingman has transformed from glorified paper weight to coveted construction site tool. I am surprised at how excellent and practical this ~$40 tool is. Also, I apologize for the pictures of the clapped out Wingman. Usually I photograph my knives and tools before carrying them extensively. In this case I did not. The Wingman has an overall length of 3.8″ (closed), weighs 7.0 ounces, and is made in the USA. This is Leatherman’s budget full size multi-tool. They released this a couple years ago along with the Sidekick, which is basically the same tool, but has a saw instead of scissors. I figured I’d get more use out of scissors than a saw. What drew me to the Wingman is the fact that it came with spring loaded pliers, and that it was cheap. For around $40 I was willing to take a gamble on the Wingman and see if I liked the spring loaded pliers and pocket clip. The pliers are excellent. The teeth are fine, and the jaws line up nicely with each other. The spring loaded feature is awesome. I used these pliers extensively for all kinds of jobs; pulling staples and nails, manipulating bolts, and getting into tight spaces. Leatherman is known for their pliers-centric tools, and even the budget Wingman doesn’t disappoint in the pliers department. The wire cutters are also handy. I ended up using them to hang pictures and install light fixtures. The wire cutters don’t close all the way like on my Blast, but they still cut wire easily. The knife and scissors are accessible without opening the tool. This is a great feature, as the knife was the tool I used the most next to the pliers. I did not EDC a stand alone blade when I was working on the house, instead relying on the knife supplied by the Wingman. This is a 2.6″ blade, which is more than adequate for most folding knife jobs. The blade is a partially serrated reverse tanto with a partial hollow grind. The knife is accessed with an oval thumb hole. The blade runs on little phosphor bronze washers, and I am able to open the blade with one hand. This is another feature that came in handy all the time. I used this knife quite a bit for a wide range of construction related tasks. Everything from trimming expansion foam, cutting open tubes of caulk, scraping away paint, trimming wood shims, cutting rope, cutting fiberglass insulation, breaking down boxes, and the innumerable other random tasks that come up in a day of varied manual labor. I found the knife to be more than adequate. It held a good edge for several weeks. When I was ready to sharpen it I noticed some edge deformation on the serrations, but I was able to sharpen it away on my SharpMaker. It gets extremely sharp with little effort. On the subject of serrations, I like the ones used here. They are mild and easy to sharpen. Normally I’m not a big fan of serrations, but found them handy on a tool like this. At one point in the project I forgot to sharpen my Wingman and the serrations could still cut long after the plain edge dulled. The blade locks open with a liner lock. There is a little up and down play in my knife, but I was too busy using the tool to care. I used this knife hard and never had a problem. The scissors saw a lot less action than the knife, but they come in handy for more delicate tasks like trimming away heat shrink from electrical cables, cutting weather stripping, and other more precision oriented tasks. The scissors are sharp, and they are a good size, but I wouldn’t want to use them for extensive cutting. They are also accessible without opening the handle, and they lock open with a liner lock as well. You need to open up the handle to get to the other tools. The tools inside the handle that I used the most when fixing up the house were the screw drivers. I used a screw gun a lot, and had a good assortment of manual screw drivers with me, but having the Wingman on my belt meant that I always had a flathead and Phillips driver on me, wherever I was, so both drivers got a lot of use. The Phillips driver is excellent. It is a true 3-D driver and works great on normal screws. The driver comes to a fine point so it even works on more delicate screws as well. The main Flathead driver is also servicable. It’s thick and wide. I found it to be great for light prying and regularly used it to open paint cans. There is a finer Flathead driver on the file for more delicate tasks like replacing outlet covers. I must confess that the can opener / bottle opener didn’t see a lot of action, but these are handy to have, especially at a camp site. The file also didn’t get much use. It’s a single cut file and it’s a decent size. I used it to remove the burr on some aluminum, and it did a good job. The file has a tiny ruler on the back side. The ruler is less than an inch long and is basically worthless. I’d prefer a double cut file on that side, but if they did this to keep costs down I won’t complain. Rounding things out is a plastic package opener. This is for slicing through heavy plastic clamshell packaging without cutting the contents of the package or your hand. I used this to open up the plastic packages containing batteries and new locks for the exterior doors. This is kind of an odd tool to find, but it works well. It came in handy after countless trips to the hardware store. An interesting feature to the Wingman is the inclusion of a pocket clip. I thought it might come in handy, and I did try to EDC this tool using the pocket clip a couple times. I found that the tool was too heavy for this to work well. I had an extra Leatherman nylon sheath lying around and found that was the way to go. Ironically, when using the Wingman with the sheath I found my fingernail catching on the pocket clip a number of times when removing the tool from the sheath. This was fairly painful. I think I will remove the clip at some point as I prefer a belt sheath, and the clip gets in the way. I think it’s worth commenting on the general construction and build quality of this tool. For $30 I wasn’t expecting a whole lot. The Wingman is surprisingly solid. it is assembled from stamped parts, which is how they keep the cost down, but the steel they use is thick and it feels substantial. Just like on the Micra and Squirt PS4, I am impressed by how well made these tools are for the money. I’ll admit that I’m not the best person to do these multi-tool reviews. Most of the time I’m just not doing enough cool stuff to test out a tool like this fully. Most of the time I am at a desk shuffling paper around. When I exercise, it’s usually in the controlled environment of a gym. But buying the fixer-upper house was a great excuse to take this Wingman for a spin, and I ended up spending a lot of time with this multi-tool. At the end of the day, I have a lot of respect for the Wingman. It was very helpful to have. I used it all the time and everyone else working on the house was asking me for it at some point. Carrying it on your belt is the way to go. I quickly forgot it was on my belt until I needed it. In my opinion this is much better than fishing around for it in your pockets or using the pocket clip. The Wingman is a budget multi-tool, but I think for real work that is a good thing. People who work construction for a living beat the hell out of their tools. They don’t carry $100 pocket knives; they carry $5 folding box cutters. The ~$40 Wingman is a definite upgrade over box cutters, but it’s still at a price point where I didn’t care if I got caulk all over it, or if we needed it for a messy job involving quick-crete. It took a beating and got the job done time and time again. My EDC when working on the house was this Wingman, my Casio DW-5600E, and a Streamlight MicroStream (compliments of Ben). This was a rock solid EDC. All of these tools are simple, rugged, and reliable. I highly recommend the Wingman. It’s not just a great tool for the money; it’s a great tool. The spring loaded pliers and easy access knife and scissors are luxuries I didn’t have on my expensive Leatherman Blast. All the tools work well except for the ruler. The wire cutters could close all the way. Beyond that, I find little to complain about. The Wingman is a great inexpensive multi-tool. Buy one and find something cool to work on. 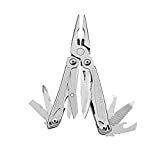 I recommend purchasing the Leatherman Wingman at Amazon. Please consider that purchasing anything through any of the links on this website helps support BladeReviews.com, and keeps the site going. As always, any and all support is greatly appreciated. Thank you very much. I grew up with Leatherman tools. My dad always carried one, and to this day he still has his Leatherman Juice on or around him most of the time. In Scouting, most people carried a multitool of some kind. The first knife that I cut myself with was my dad’s Leatherman Wave. When we climbed Mt. Whitney, I didn’t take a bushcraft knife, I didn’t take a modern folder; all I had was a Leatherman Squirt PS4. If you can’t tell by this point, I’ve got a lot of love for Leatherman tools. Under those circumstances, it’s pretty obvious why I’d be drawn to the Leatherman Charge TTi. Full size, all locking tools, built like a tank from materials even a knife snob couldn’t turn their nose up at; you see where I’m going. Last Christmas I decided to take the plunge and purchase one. It’s less and more than what I expected, and I’ll let you decide if that’s a good thing. I’m sure every gear nut knows this feeling: you only need a tool when you don’t have it with you. That’s part of the problem here. I’ve carried the Charge in the pocket, on my belt, or in a bag for more than a month, and all the tasks I thought I’d be using it for disappeared whenever it was around. Who knows, maybe the plumbing was intimidated into submission. The Charge TTi has a closed length of 4” and a blade length of 2.9”. It’s .8” thick, and weighs 8.89 oz. I haven’t done the math, but it’s approximately heavy enough to qualify as assault with a deadly weapon if thrown. Partially responsible for the dreadnought class tonnage is that all the tools lock while open, a design choice that I still don’t know if I agree with yet. On one hand, it’s comforting to know that the blades won’t be snipping my fingers off if I do something stupid. On the other, I don’t know why an eyeglass screwdriver needs to lock. There’s a bit of play in all the locks, but that’s par for the course with multitools. You can check out all the tools on the Charge through this link, the below chart, or the picture below that. I can’t think of a tool they left out, and their inclusion of a flathead screwdriver when the Charge already has two bit drivers suggests they were running out of ideas. That, or they knew too many folks just used the flathead for prying open paint cans and wanted to make replacement easier. Either way, all appropriate tools are present. As I noted earlier, the Charge frightened away most of the chores that I would have used it for, but I was able to reach for it a few times. The pliers (which are cast, not machined) are wide and aggressive enough to remove the aerators from sinks, yet come to enough of a needle point for splinter removal. I didn’t use the blade hard enough to push the S30V to its limits, but it worked fine on boxes, apples, and spreading condiments on a sandwich. More than a few bottles of beer were opened as well. The only complaint I have is the absence of replaceable wire cutters, which are common enough in other Leatherman tools that I can’t see why they weren’t included. The handles (if you couldn’t guess) are made of titanium. Well, the scales are. The non-tool guts of the knife are made of steel; I don’t even want to know how difficult the machining would be otherwise. By multitool standards the construction is pretty tight. Nominally, it’s held together with torx screws, but that would imply that you can disassemble it. This is not the case. For some reason that only the engineers at Leatherman know, these torx bits have little pins in them, which makes them incompatible with most torx drivers. A quibble, but a galling one. Before I get too negative, I will note that the finish left on the scales is truly beautiful, in a chipped stone kind of way. Imagine a brick. Now shrink it, make it a little slimmer along the way, and put it in your hand. That covers the essential points of the ergonomics here. Normally I wouldn’t be so dismissive, but compared to the Skeletool the Charge is lackluster at best. To be fair: the edges are rounded, and I’ve never felt a hotspot, but it doesn’t conform to your palm the way other Leatherman tools do. If you’re carrying the Charge with the pocket clip, then disregard my line about “never feeling a hotspot.” You should have a good idea why farther down. Take that same shrunken brick and strap it to your belt. Honestly, it’s not that bad that way. If you’re working in an industrial setting, no one is going to care about a multitool, and even most offices won’t mind a Leatherman on your belt. The worst I can say is that it can compete for space with any bag you might have, depending on how you wear it. Mine came with the leather sheath, and I haven’t had any problems with it. The side pockets on it are nice for a AAA flashlight and a mini sharpie. Are you feeling particularly brave? Clip it to your pocket. Funnily enough, its stiffest competition comes from within the brand, in the form of the Leatherman Wave. The Wave shares most of the design language of the Charge: a full set of locking tools, outside accessible blades, and a nearly identical toolset. Of course, it doesn’t have the premium materials that the Charge TTi does, but it also costs half as much. Whether those materials are worth the premium is up to you. Leatherman isn’t the only game in town; Victorinox, Multitasker, Gerber, and SOG all make plier centric multitools. I imagine that I’d have similar complaints if I were to review any of their offerings, as they’re all near the same weight or heavier. At the end of the day, who should buy this? Well, despite its staid design, it really is the top of the heap. If you want a multitool that has the same materials as a Spyderco Sage 2, this is your only option. The all-locking tools may be unnecessary to me, but a godsend to someone else. It’s a nice enough object that I’m not going to get rid of mine; this’ll just be consigned to the glove box, where it can do some real good in a pinch. Next up – the ZT 0900. You bastards finally got to me. 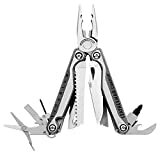 I recommend purchasing the Leatherman Charge TTi at Amazon, or BladeHQ. Purchasing anything through any of the links on this site helps support BladeReviews. Any and all support is greatly appreciated. Thank you very much.